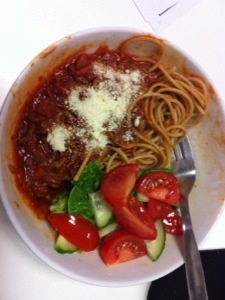 Sorry no blog last night as just never had time to write it, but here is yesterdays food diary now. I was up early as i was getting the train to meet a friend for a day of shopping and some lunch. 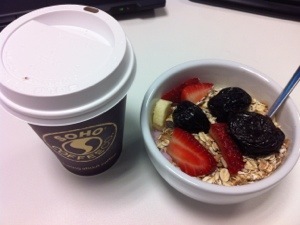 so breakkie was some fruit, yogurt and museli which a coffee made with skimmed milk. 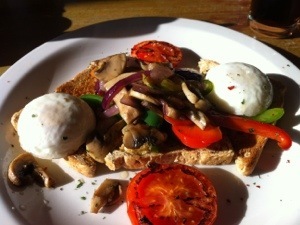 another 2 cups of tea later and several hours of walking around the shops it was time for a spot of lunch, we went to a Turkish cafe and i ordered a veggie breakfast of poached eggs, mushrooms, peppers and tomato on toast and a diet coke to drink. i thought i would of not been to hgh syn, mut i could tell it was smothered in butter, also they used granary bread so not a hexb and lots of oil, in fact i felt quite queasy afterwards, but it did taste nice at the time. 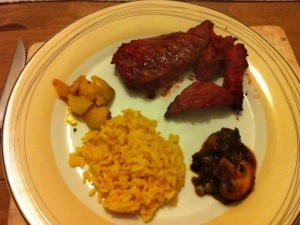 It was dinner time by the time i got home so hubby had prepared a indian lamb recipie he had seen, which was tandori lamb steaks with shallot pickle (add mustard seeds to pan, add shallots, tumeric, chilli powder, salt, lemon juice and sweetner – delicious!) 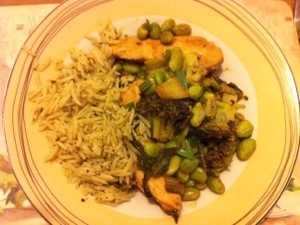 boiled rice and a mushroom and spinich curry. 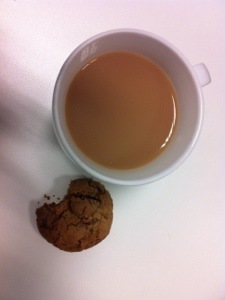 i had to have two helpings this size as was still feeling a bot delicate from the oily lunch. 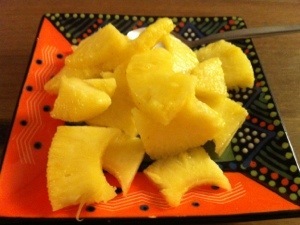 I also had some fresh pineapple chunks later on. nothing specific but lots of walking whilst out and about. 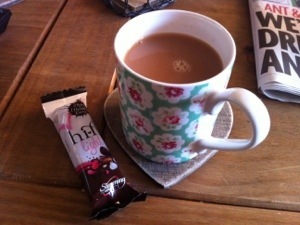 choccy mouse and marshmellows – yum! 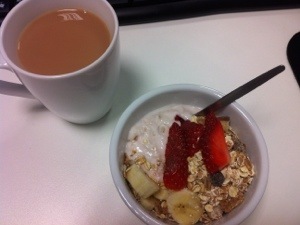 Had some things to do this morning before work so took my breakfast with me and ate it in the office when got to work. i took the photo before as i knew it would get mixed up in my bag and look a right old mess by the time i got round to eating it… and i was right. 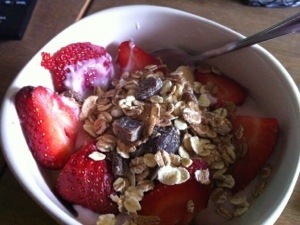 I used frozen tropical fruit that i defrosted overnight in the fridge along with fat free fromage frias and muesli. 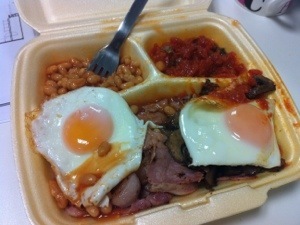 I had the lunch i took into work yesterday but didn’t eat due to the “breakfast box” incident. 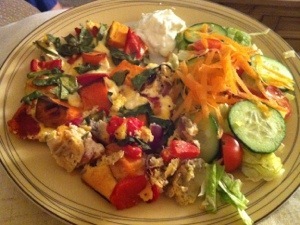 It was roasted veggies with egg, salad and 1 tbsp of helmans light salad dressing. i also had a side order of mini baby bell light. I picked up a limited addition Muller light turkish delight flavour to have afterwards, which was lovely and turned out to be free! I stuck to my 4 mugs of tea today (which i work out to be just under 250ml of skimmed milk) but i did help myself to one of the celebrations chocolates from the chocolate table which are 2 syns each, im happy i stopped at one though as that’s the bit i usually find difficult. 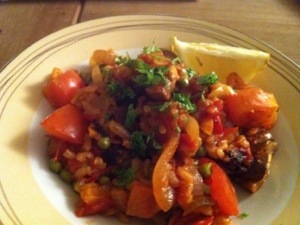 Dinner tonight was vegetable paella with mushrooms, onions, peppers, peas, tomatoes, veg stock, smoked paprika, thyme and a sprinkling of paella rice as 1. i wanted to stick to the 2/3 superfree rule and 2. there was only a thimble full left in the packet! i chopped some parsley and squeezed a wedge of lemon over to serve. 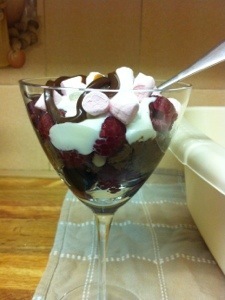 Later on in the evening i made a desert of fresh raspberries topped with sainsbury lighter chocolate mousse, fat free fromage frias sweetened with sweetener, 1 tbsp of aerosol cream, 12g of mini marshmallows, and 1 tsp of choc sauce. 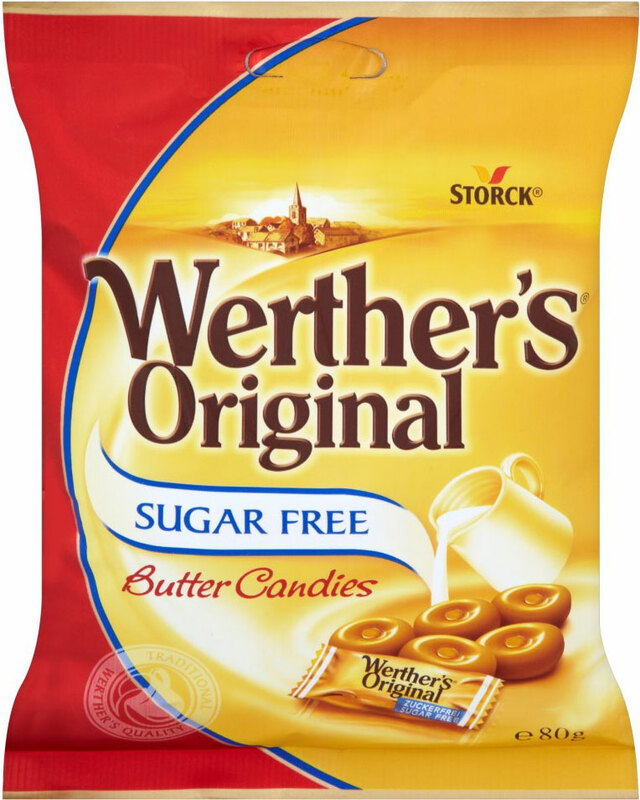 it was delicious but all those little syns add up and the lot was 7.5 syns, not to bad i suppose if you’ve not had many more during the rest of the day – think i will have it more as a now and again treat though. 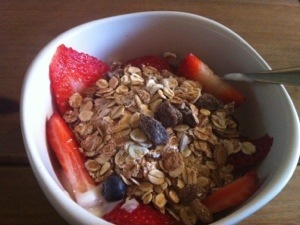 After my good start to the day of the breakfast that’s fast becoming to norm, of strawberries, blueberries, banana, fat free yogurt and Dorset cereals muesli. 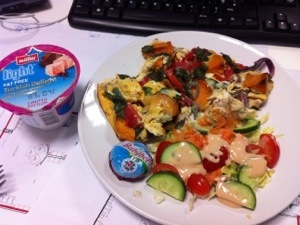 i packed up my salad and the remainder of the veggy eggy delight of yesterdays dinner and with an apple and satsuma in my bag i was ready to head off to work. 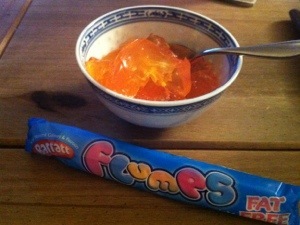 this is where things started to go a bit wrong. with the whole office getting a order ready mid morning to go to the breakfast van that is a permanent feature in our car park, and with the peer pressure upon me i caved and ordered myself a breakfast box, now i know it’s not a great choice of brunch however i did attempt to keep the syns to a minimum by not ordering the sausages or black pudding it came with and took the crusty white bread it came with home for hubby (i don’t let him buy loafs of white bread anymore as i’d eat the entire loaf!). So the backed beans and tomatoes should be free, the fried eggs are 0.5 syn each, so not to bad, the bacon however, i’ve worked roughly to be about 7.5 syns (thats for 100g, there was 3 slices?) 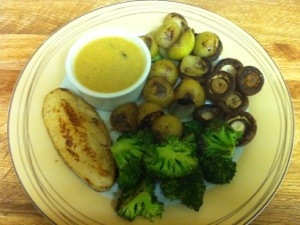 i also removed the fat and didnt eat it but i think it had been cooked in fat so will count the whole 7.5 just to be on the safe side, the mushrooms which could have been free, but were were likely to be cooked in oil, again 100g work out at 7.5 syns, not sure how many grams i had but will count the whole 7.5 again. 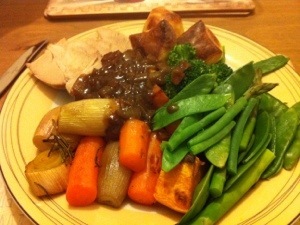 i also had to leave quite a bit of both as it was so filling. I will still so full i didnt have my lunch i’d taken with me but i did manage the apple and satsuma and during the afternoon. I also had a mini baby bell after work. For tonight’s dinner i meticulously cut every inch of fat off some lamb pieces (it didnt leave a lot of lamb!) and browned it off with some spices and mixed with some lamb stock and the rest of my paprika, chilli and tomato soup i made, which also contained carrots and onion. 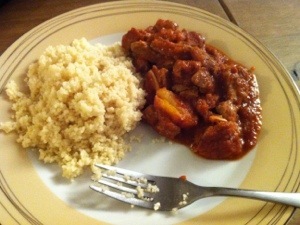 i added a hexb portion of dried apricots, sultanas and flaked almonds too then oven cooked it for 1.5 hours and served it with a small portion of cous cous. 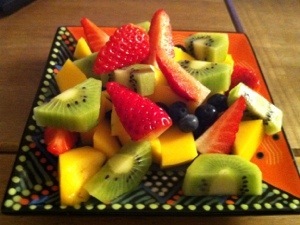 And as i’d had my syns for the day today, dessert was a syn-free platter of fruit. 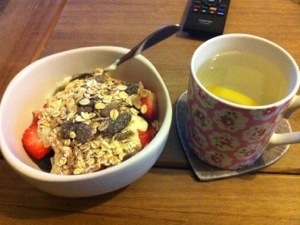 For todays first meal I had another fruity, yogurt, muesli topped bowl with a hot water and lemon to drink. 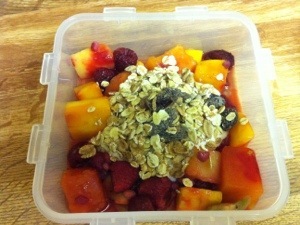 And for lunch I ate the soup I’d made last night with two rivita (half a hex b) followed by a tropical fruit salad. 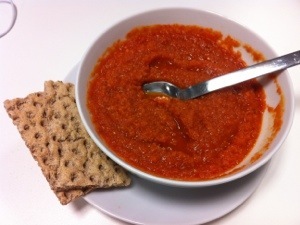 i made the soup from canned chopped tomatoes, paprika, chilli, onion, carrot, veg stock and red lentils. Simmered on the job for half an hour then blended until smooth. 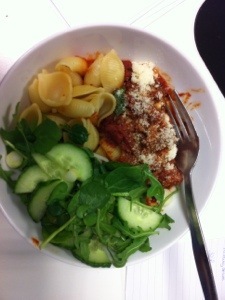 It was really filling and I crumbled in the rivita as croutons which worked well. 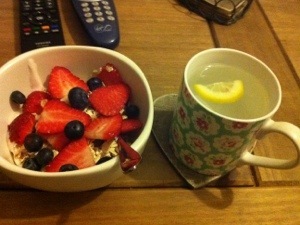 I was really busy today so only had 3 mugs of tea and a satsuma and apple as snacks. I even managed to say no to the freshly stocked chocolate table! I was home from work on time so walked to the local shop to get some quark to add to tonight’s dinner and took a sw light hi fi bar with me for the walk. I fried some red onion, garlic and rosemary in fry light in a frying pan then put them in an oven proof dish along with the left over roasted sweet potato,some red peppers from a jar, spinach, then poured in a few whisked eggs. 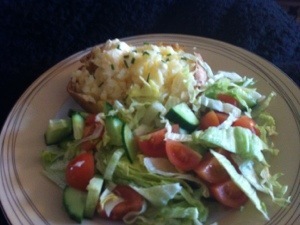 Then I spooned on a few blobs of quark and popped it in the oven for twenty mins while I made a big salad to go with it. The white blob is some quark, fromage frias, garlic and fresh parsley as a sort of salad dressing, however i put so much garlic in it i didnt eat it in the end. 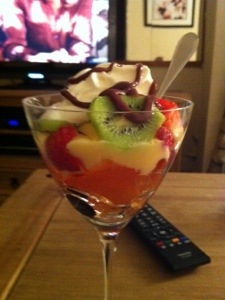 As I’d not had any syns today I made my new favourite of sugar free orange jelly topped with 2 tbsp’s of low fat custard, strawberries, kiwi, mango, fat free fromage frais, 1 tbsp of aerosol cream and 1 tsp of choc sauce.